Will Debate Drama Impact Polls? Republican presidential front-runner Donald Trump has doubled down on his decision to skip Thursday night's FOX News Channel debate, even as his opponents criticize and mock his position. "Donald is a fragile soul," Republican Ted Cruz said. "If someone didn't show up at the interview, you know what they'd say? 'You're fired!'" Cruz has challenged Trump to a 90 minute one-on-one debate - no word yet whether Trump will accept the challenge, but Trump did fire off a tweet, saying, "Even though I beat him in the first six debates, especially the last one, Ted Cruz wants to debate me again. Can we do it in Canada?" Marco Rubio called the back-and-forth a theatrical and interesting sideshow. Chris Christie says Trump is making a big mistake. 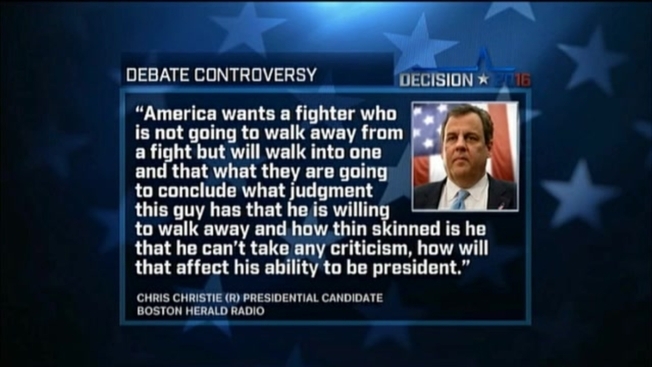 "America wants a fighter who is not going to walk away from a fight, but will walk into one and that what they are going to conclude what judgment this guy has that he is willing to walk away and how thin skinned is he that he can't take any criticism," Christie said on Boston Herald Radio. "How will that affect his ability to be president?" Meanwhile, Democrats have a debate controversy of their own. NBC News and the Union Leader have paired up to host a Feb. 4 debate in New Hampshire - a debate that is not on the list of Democratic Party sanctioned debates. Hillary Clinton is pressing the Democratic National Committee to add the debate - indicating the threat Sanders now poses in Iowa and New Hampshire. Bernie Sanders initially said he did not want to jeopardize his participation in future party debates, so he was staying out. But his campaign issued a statement on Wednesday night saying he will participate on Feb. 4 if the Democratic National Committee gets involved, and if three additional debates are scheduled in March, April and May. Union Leader, MSNBC to Host Democratic Presidential Debate in N.H.
"The dynamics of the race have changed and Sen. Sanders has significant momentum. Sen. Sanders is happy to have more debates but we are not going to schedule them on an ad hoc basis at the whim of the Clinton campaign," Jeff Weaver, Sanders' campaign manager, said. Union Leader editor Trent Spiner said Sanders holds all the cards, even as the DNC has declined their request to sanction their debate. "If all three presidential candidates show up and Granite Staters overwhelmingly ask for this debate, I find it very difficult to believe that a political party could say no to getting their candidate's voice out," Spiner said.